Probably a faculty Christmas party at what used to be the old library behind the gymnasium. This picture was taken in the seventies, obviously from the flared pants; and the latter half of the decade when I was already in college because Mrs. Marcela "Marcia" Guevarra is in the picture. I cannot recognise the one sitting with the guitar because even the original picture was too dark. 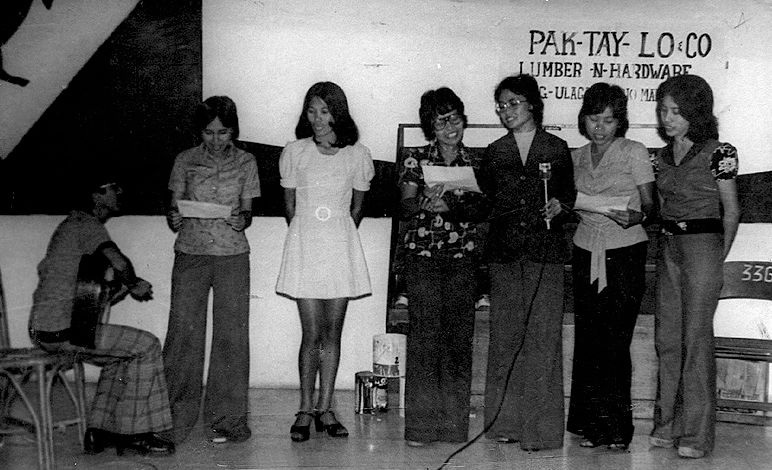 From left, though, are Ms. Luz Morada, Ms. Gloria Lacay and Ms. Alice Rivera. If I remember correctly, the one next to her was a nun and if anyone knows better, please say so using the comments section below. Completing the picture are Mrs. Marcia Gueverra, who I just remembered was still Ms. Magsino at the time; and Ms. Cleofe Babasa.